This seal looks like a late ED III example but the style is strange and the inscription has no meaning. This one was sold by a German auction house for EUR 1050,-. Below see an original in the British Museum. Note the strange drilled holes on the seal surface. 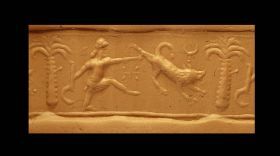 On most Akkadian seals humans or bullmen are involved in the contest. Animals crossing each other are more common on Early Dynastic seals. Please see picture with an authentic seal in Boehmer 1965.